Can’t resist the lure of visiting the bright lights and gambling floors of Las Vegas, but have the kids in tow? It’s the last place you’d describe as child-friendly and for the most part you’d be right but there are some great free and paid attractions for the whole family to enjoy. First and foremost, the gambling floors are a no go zone with your children. It is a little ambiguous in that minors are allowed to make their way through these areas (as you will likely have to if your accommodation is in a casino) but stalling for any period of time will prompt a move on notice from one of the hundreds of staff. It’ll all be very friendly, but just keep it in mind and make your plans prior to leaving your room or once you’re outside. The good news here is the casinos (in a bid to win your gambling dollars) put on some of the most elaborate themes, shows, light and water displays in their shopping and lobby areas which are fantastic for kids of all ages and parents too – and all free! You’ll be in the desert, so unless you time the shoulder seasons it’s likely to be blistering hot or fairly cold, especially at night. The crowds are unquestionably biggest in the summer months and the main drag can become impossible to get up and down, but if its some sun you’re after then don’t let that put you off. Just about all the attractions that suit kids in Las Vegas are indoors and even in winter it barely rains so excluding swimming you won’t miss out if you happen to go November – March, and you’ll probably find pricing on hotels much cheaper. You would never imagine you are in the middle of the desert. Though there may seem not much to do with the kids, there is actually a lot you can do if you just know where to look. Most of the hotel websites provide information on what attraction they currently have going on, so be sure to check websites for updates. Mandalay Bay may be at the far end of the strip but inside of the hotel is the Shark Reef Aquarium. 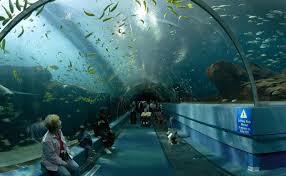 Inside you will find over a dozen different exhibits including sharks, jellyfish and crocodiles. A fantastic place to take the kids and spend a few hours learning about the animals of the water. You can also catch one of the many monorails of LV from the hotel down the trip which saves walking in the hot or cold weather. Why not stop and watch the water dance to the music? Every hour, inside the Miracle Mile Shops there is rainstorm! Yes it rains inside, so take the walk to the shops and don’t miss the thunder, lightning, fog and pouring rain. There are also the many fountains and mini fish aqauriums found inside Caesars Palace which is a great way to entertain the kids if you have a couple of hours free. 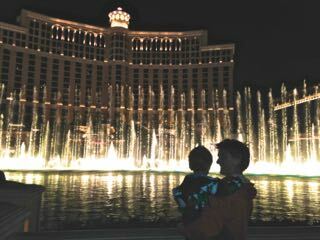 One more attraction you cannot miss when in LV is the fountains of the Bellagio. Located outside the Bellagio, the dancing streams of water are choreographer many different well known songs and differently not work missing. The show is usually on every half hour so not long to wait. Bit of shopping, something to eat and let the kids play. Another great place to visit and easy way to spend the day is at Town Square which is one the largest open area dining, shopping and entertainment precincts in Las Vegas. This place is absolutely fantastic for the whole family. 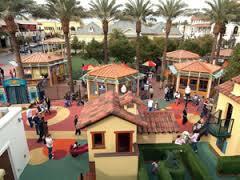 There are over 200 shops in the presinct and a huge play area for the children. There are many different types of restaurants and food outlets to accommodate the whole family. During the festive season, Town Square is lit up with thousands of lights and Santa comes to visit. Definitely a must while in Vegas. For the older children, if you get the chance and are happy to spend the extra money, visit Hover Dam or the Grand Canyon. You can get there by driving yourself or there are many companies who offer day tours (you can book ahead for these are often companies have great deals) . Both locations are definitely worth the visit, as is the history behind them. If you are taking younger children (babies -3YO), I would recommend taking a pram. Though LV is jammed packed with many hotels, the walk between them can be a long one at times. There are also not many lights to cross the roads, so you use the over or under walkways. There are many buses which go up and down the strip and to the shopping complexes, use these to your advantage. There are many hotel which cater extensively to families. Some include The Excalibur features midway games, travelling entertainers, and the Tournament of Kings, a dinner-theater extravaganza with jousting knights, fire-breathing dragons, and a team of tumbling jestors. At the opposite end of the strip, Circus Circus entertains children of all ages in its Adventuredome indoor amusement park and in a midway featuring circus acts on the second floor above the casino level. Want to spend and evening or even lunch free from the kids and enjoy some quiet time with your partner? There are many business in Vegas which offer babysitting services. Most of the hotels have their own in house service but these can be very expensive so we opted for a private company; Artsy Nanny. They are a fantastic business where you can go to them at their centre or they can come to you at your hotel. The nanny’s are all licensed and are flexible to your needs for the children. There centre is located at Town Square. Like all destinations, how long to stay is more about how much do you want to see and do. Remember Las Vegas is still very adult orientated and this destination guide only skims the surface of what there is to see, do and eat in Sin City. I don’t recommend staying in Las Vegas for 2 weeks with the family, but 4-6 days is enough to see the many attractions. 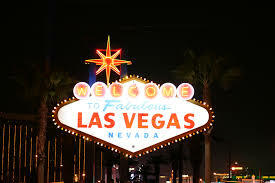 Check out all the reviews for attractions in Las Vegas here.